A lovely collection of iron baskets lined with cotton fabric. Several formats, round baskets, oval baskets and rectangular baskets. 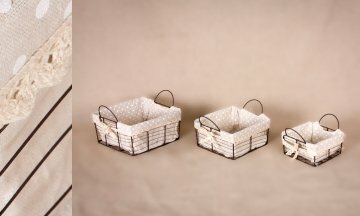 Iron Baskets, these baskets are called, perfectly adaptable to the bathroom and the kitchen. And to any corner of your home. A useful utility for storing things that we like and we most need every day.